Welcome to Monday! I can’t think of a better way to start the week off then with a party! 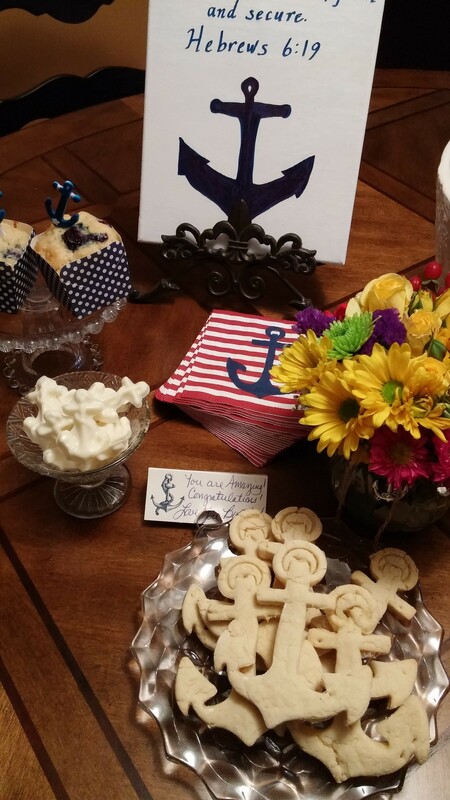 An anchor theme party! Parties are super easy to do when you start with a theme! Once you decide on a theme, the rest will fall into place! A party can be large or small. You can have it any time of the day too! This party was a breakfast party! I served blueberry muffins and a healthy sugar cookie. I added a few white chocolate anchors to go with the theme but they did not get eaten for breakfast but it’s a party, why not! It was easy to decide on my theme. Anchors are a favorite of my special party girl! The Hebrews scripture is also a favorite! I started with my online resources for the party supplies. My favorite go to, is Fancy Flours. They can be a bit pricey but most of the time you can find all you need! I LOVE the new square muffin papers! They are sturdy and hold up on a cookie sheet. 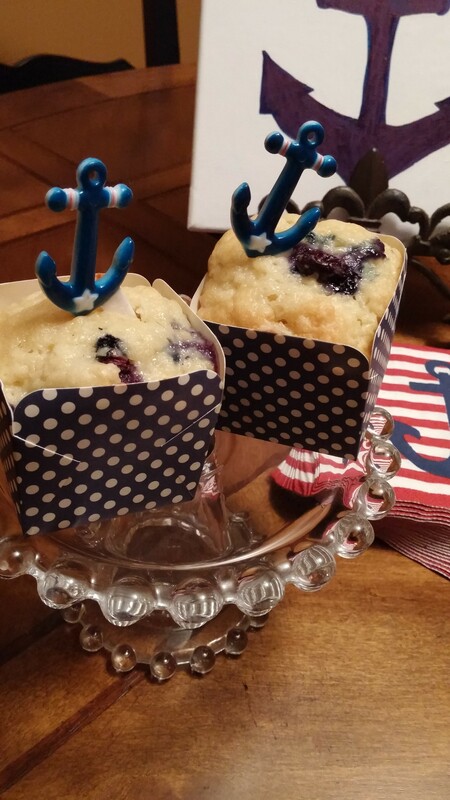 I love the contrast of the polka dots next to the stripe in the anchor napkin! 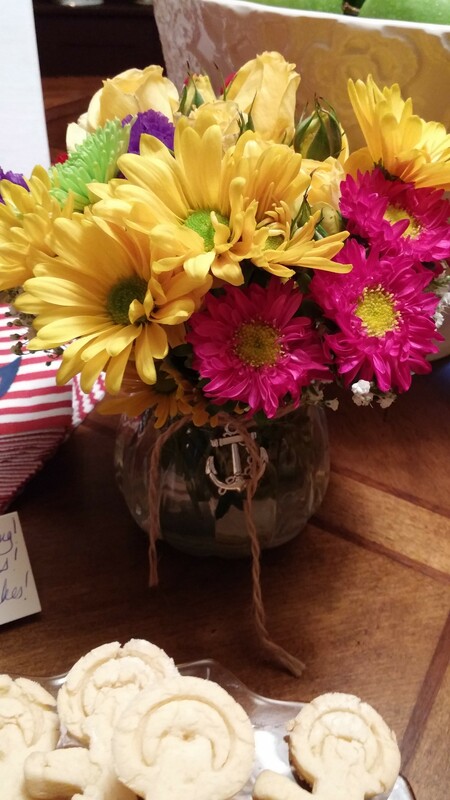 I was surprised to find the flowers in the vase with the anchor charm in the floral department of Wegmans! I also found a ring on Etsy with an anchor and the words Refuse to Sink on the inside. Etsy is another good resource for party supplies and can be very budget friendly too! The best decoration for the party is the canvas! 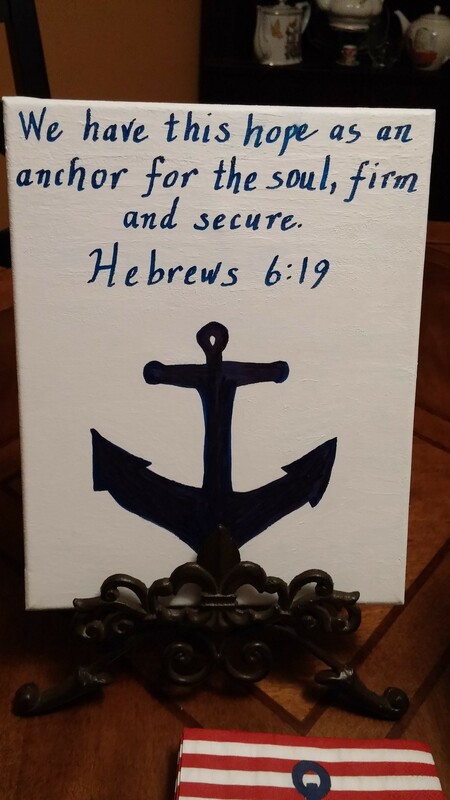 My artistic friend, Ann, took the scripture and made the canvas! Her special touch added a beautiful heartfelt sentiment to the party! Make today a party kind of day!